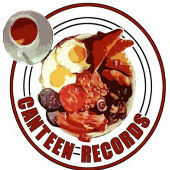 When was Canteen Records formed and who by? Canteen Records was set up by the producer/dj called BIAS and artist Dan Simm. We had a group of friends who were making music and we wanted to be able to release our material with total creative control. We wanted to pay attention to the whole package, with artwork and music as important as each other. Who’s currently a part of the squad? BIAS, Giacomo, Sam Sure and Giacomo, Special Reserve (Folk singer Christina Charlie and Bias), Lewis Parker and Yungun, The Benefits. What’s been the biggest plate of success so far? Fortunately everything has gone down well. The Worry Beads e.p. by BIAS shifted the most units. Also several school kids went up for seconds of Programmed Percussion by Giacomo. Is there anything in the cooker? A new album by Giacomo, a 12” and new album by BIAS and an e.p. by Special Reserve. Also a compilation album featuring tracks from our artists and the best demo’s sent in by people. Oven chips, frozen pizza and beans!! Happy with the UK scene and what’d you change? We’re not sure if you mean the UK music scene in general or the Hip-Hop scene. The UK music scene is a bit weak at the moment. There is nothing to really get excited about on major labels. However there is lots of stuff being produced by small collectives which is excellent but its hard to keep track of the good tunes. The technology to make and release music from your own bedroom is so accessible now that a lot of rubbish is being released, which makes it hard to sift the gems from the detritus. The UK Hip-Hop scene however is very healthy. Some great music is being released by independents who are taking matters into their own hands. Attention to production and packaging is much more professional now. Yet the scene is extremely cliquey and insular. People need to get over hang ups about what is ‘Hip-Hop’ and explore new musical boundaries. Also not to be concerned if the final product is made on an SP1200 or MPC 3000 or if the drum break has come from an original record. As Joe Meek said ” If it sounds right, it is right”. What other UK labels do you dig/see as the blueprint? Nothing really at the moment. Twisted nerve had some fresh ideas when they started, also the early days of Mo Wax but nothing that stands out. The standard of independents is pretty good now. We don’t buy enough contemporary music to know!! Who designed the dope label logo on your site? What’s the most vital ingredient to making a label work? Quality control. Don’t put out poor product. Wait until your material is good enough. Wait until the design is right. Attention to detail, don’t cut corners and except second best. Also don’t try and conform to preconceived ideas. Just release what you want and how you want. You are never going to be able to please everyone. Don’t worry if its not this type of music or that type of music. Just make sure its good music whatever the genre!! What have you got planned for the rest of 2004. New signings, releases, shows?